← Nomad Factory Drum Tools on promo for ONLY $49! 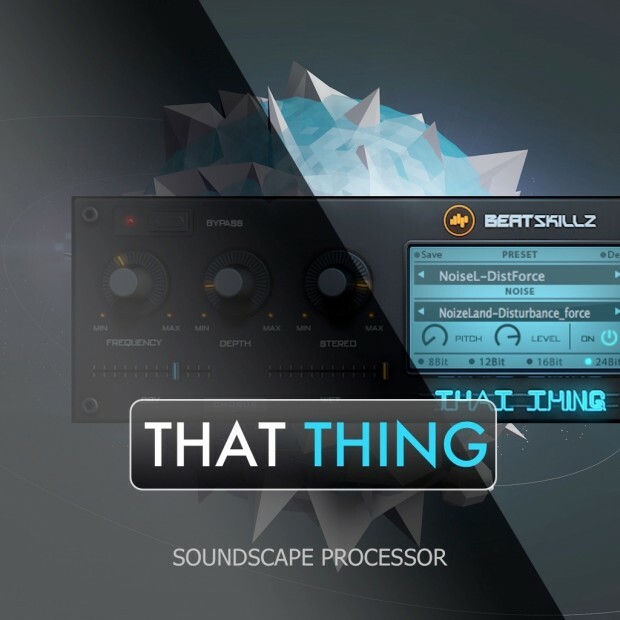 BeatSkillz are running a crazy sale on That Thing. From today until August 26th you can pick up this fantastic multi-effects processor for only $9! YES, “$9″, a great saving of $50 off MSRP. So SAVE BIG and pick it up at the DontCrack Store, today! That Thing is a multi effects processor that was designed to get you That Thing missing from digitally perfect tracks today. It features a beautiful wide and deep chorus section great to thicken anything from synths, vocals, bass, pads drums and other sounds. It features a beautiful wide and deep chorus section great to thicken anything from synths, vocals, bass, pads drums and other sounds. The soundscape generator features 50 samples of old vinyl players, tape machines, old radio, tube gear, atmospheres, ambiences etc. These add to your sound with an envelop follower, so the sounds add in only when signal is present and move, and pan with the level of the signal. Easily change the pitch of the soundscape to make it work with any audio you pass through it. The plugin features a bit crusher and distortion that emulates the sound of vintage drum machines giving you a choice of 8/12/16 and 24 bit audio. There is also an analog Low Cut and High Cut filter section designed to shape your sounds further. A wet and dry fader is included to blend in the effects with your original audio. This entry was posted in DontCrack, Plug-ins, Promotions and tagged BeatSkillz, bit crusher, Chorus, Drums, Effects, Guitar, multi-effects, Saturation, Synth, Tape, That Thing, Tube, vinyl, Vocal. Bookmark the permalink.